I am the eldest of four, and have four children of my own. Pregnancy, birth and babies have always been a big part of my life! Each of my pregnancies and births was unique and special in its own right, but there were times where I had so many questions, or doubted myself, and I would have dearly loved the unwavering support that a Doula can offer. I knew that this was a role I would love to fulfil for other women, and that to some extent, I had already been doing and I began to look in to training to become a registered Doula. 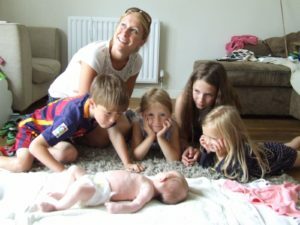 My first Doula baby – and all my babies gazing on! I have been enthralled, fascinated and amazed by pregnancy and birth for as long as I can remember. I believe passionately in a woman’s right to give birth wherever and however she chooses and it is my role as a Doula that enables me to support women in achieving this. I feel strongly that women deserve a continuity of care, an impartial advocate and access to all the information and choices relevant to them. I enjoy supporting all women and their pregnancies, but as 3 of my 4 pregnancies were breech babies, I have a particular interest and desire to support mothers experiencing the same. I was also able to have a VBAC (vaginal birth after a caesarean) and again, love working with women who want to explore this option. I have experience of breech birth, caesarean birth, VBAC, hospital birth and home birth. I completed my training in May 2016 and have been fortunate to build regularly on my Doula experience since then. I volunteer locally at a peer support group that provides the opportunity for informative, open discussion about all aspects of pregnancy and birth, I also work as a Breastfeeding Peer Supporter in the local area and am trained in the 3 step Rewind technique – a process which helps those who experience feelings of fear or trauma to restructure the memory so that it no longer causes them distress. I am a recognised Birth Doula with Doula UK, and adhere to their principles of best practise and confidentiality.